Drawing by Konstantin Maler. Click to enlarge the image. The Geneva II conference is the most intriguing diplomatic event since the cold war era. On the one hand, it is an example of cooperation between major players, primarily Russia and the United States, which, each for reasons of its own, want to resolve a regional conflict. On the other hand, it is a big game, in which all the players are afraid of making a miscalculation or missing out on something. Add to that total unpredictability, not only with the outcome but of the process too. In fact, even the list of participants remained unclear up until the very last moment. The stumbling block was Tehran. Two processes—building a Syrian peace settlement and finding a solution to the Iranian nuclear issue—have practically merged into one. The Syria conundrum has brought Russia and Iran very close together. Previously, Iran was convinced that Russia, of course, did not want to follow in the wake of Western policy and resisted it any way it could. Yet Russia, Iran was convinced, never went far enough and always, when it comes to the crunch, steps back, in order not to ruin relations with the United States. The unyielding and unchangeable position that Moscow has been pursuing on Syria for these past three years has come as a pleasant surprise to Tehran. Moscow and Tehran's unflinching commitment to the view that a change of power in Damascus through military means is inadmissible stems from different causes. For Iran, it is a matter of a regional balance of power and its own security; while for Russia, it is a question of defending certain principles of how international affairs are arranged and of resisting pressure from the U.S. In the end however, the objectives of the two countries coincide quite strongly. 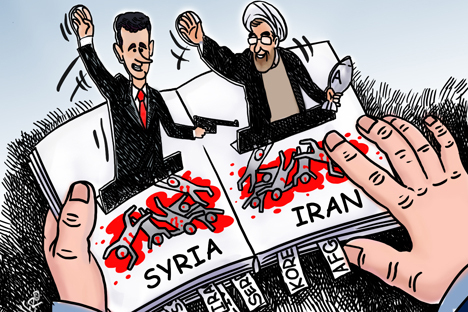 From the point of view of Russia and Iran, any outcome of Geneva II, if there is any, will be a success. After all, until very recently the predominant point of view in the world was that the Assad regime would collapse very soon. Whereas now, opponents of official Damascus, albeit reluctantly, have to talk to him. Moreover, it is hard to say whose positions are currently stronger. Generally speaking, from the moment when in May last year Russian Foreign Minister Sergei Lavrov and U.S. Secretary of State John Kerry agreed to work on Geneva II, the contents of the conference have changed. The conversation now is about identifying a circle of forces that are ready to discuss the future of an undivided and secular Syria. Clearly, radical Islamist groups are not interested in that. Incidentally, on the government's side there too are forces that believe only in a military victory. The first phase of Geneva II would be a success if, as a result of it, sides emerge ready for dialogue. The next step would then be to decide what there is for them to discuss. The debate on whether to invite Iran to the conference or not reflects the fact that Syria is not the only issue here. In terms of a Syria settlement, it is absurd to demand that a country that has so much influence on the situation in Syria should not be invited to the talks. In that case there is not much point in holding the talks in the first place. In reality of course this is not about Syria, but about U.S.-Iranian relations. President Barack Obama’s administration's attempt to introduce a new quality to these relations has been met with resistance both inside the U.S. and, of course, among America's allies in the Middle East. Although the benefits of finding a way out of a stalemate of many years would be great, mutual trust is extremely low and Washington is very much afraid of making a mistake. Moscow believes that events in the Middle East will inevitably make Iran's positions stronger. And the change in the U.S.'s line is no coincidence but a recognition of exactly this fact. That is why it is so important to have strong relations with one of the most influential countries of the region that can project strength on to Central Asia and the South Caucasus. Besides, it would be useful, not to say essential, to try and secure one's positions on the Iranian market in advance, before it is inundated – in the event of a successful reconciliation – by U.S. and European companies. Hence the talk of a possible major deal in which Iranian oil will be exchanged for Russian machine engineering goods. The deal has not yet been confirmed by either side, but given the overall context, an agreement like this would be quite logical. Naturally, Washington finds it very objectionable as, it maintains, Russia's actions undermine efforts towards resolving the Iranian nuclear issue since they, allegedly, reduce the level of pressure that is put on Tehran. In reality, the fear might be somewhat different, i.e. that the "thawing" between the U.S. and Iran would in fact play into Moscow's hands. From the Russian point of view, there is nothing specifically anti-American in its attempts to agree with Iran. Moscow's line of argument is that Russia and the United States are not allies, and therefore, one should not expect that they would sacrifice one's own interests for the benefit of the partner. However, when their interests can be combined, there is nothing to prevent that from happening. In other words, these two major powers are not friends and are not enemies to each other; they are simply independent from each other. Its variety of factors and circumstances, and mixture of rivalry and cooperation make Geneva II a truly thrilling process to observe. Syria is a game with an open finale. Unlike at the time of, say, the Balkan settlement, the West and its allies do not have a clear understanding of what it is they want. And they are now in a far weaker position in terms of imposing their will, since the balance of power is different. Everything will depend on the diplomatic skill, accuracy of analysis and intuition, which are sometimes more important for a player than the cards they have been dealt. Fyodor Lukyanov is the chairman of the board of the Council on Foreign and Defense Policy.